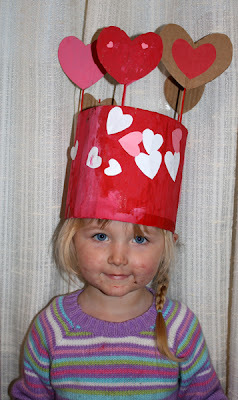 Filth Wizardry: Valentines, and a couple of other things. Valentines, and a couple of other things. Here's a quick round up of all the possibly useful valentines type bits and bobs in the archives of Filth Wizardry for you. I was reminded the other day that I don't really have a great system for looking stuff up on this blog. I should really have nice drop down menus with wonderfully categorized post lists and thumbnail images and stuff and things, but basically it took me about two years to get my arse in gear to put a "search" box on here, so all of that seems sort of pie in the sky, given that I'm often typing one handed, and now with an added small person paddling me in the face with the palms of her adorably enthusiastic little hands and shouting "Dadadaaaaa!". 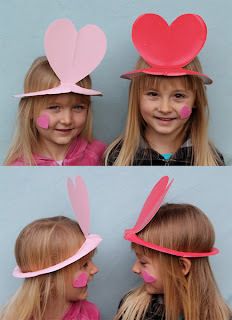 Paper plate hearty party hats. 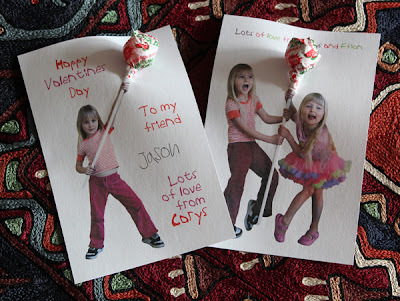 We're doing this for the third year in a row this year, because they are really cheap and easy and cute valentines, and I like seeing how the kids have grown since the last pictures too. Family Fun Magazine just published this, along with another project of ours (the Bernoulli box), which has been great for us, because they are lovely to work with and the extra income is very welcommed too. I've had a few readers contact me after noticing our crafts appearing in the Family Fun Mag, concerned that I wasn't being consulted about their use of our ideas, but fear not, they are totally above board with requesting permission to use specific original items from Filth Wizardry, and are super diligent with contract signing and all that good stuff too. I love that I am lucky enough to have wonderfully loyal readers that will take the time to let me know if they see our intellectual property being mishandled though. That makes keeping on top of the unpleasant side of blogging so much easier, so thank you to those of you that got in touch over this and other sighted uses of our crafts elsewhere. DIY heart iron on patches. 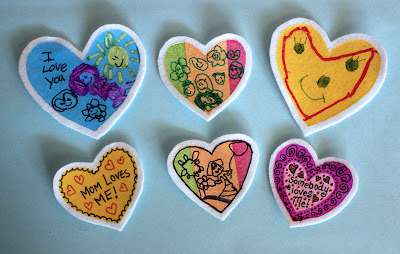 Another post I wrote over at Alpha Mom showing how to make cute little custom felt heart patches using plastic bags and pens. Great for sewing on clothing or making badges from! 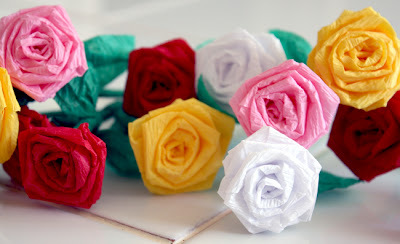 Mini Roses from Dollar Store Crepe Paper. 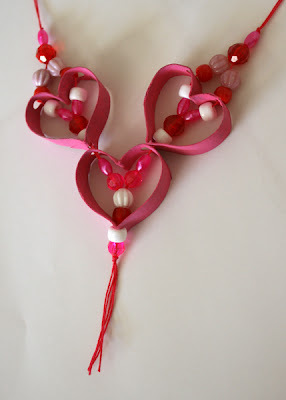 Toilet Roll Tube Valentine's Necklaces. We're doing these again this year too. The kids are really keen to make them again. 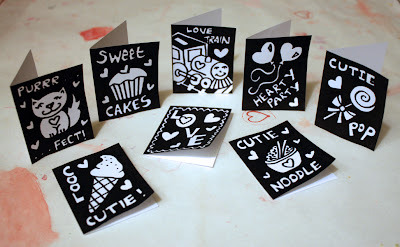 This is just a printable set of eight mini valentine's cards that I drew for the kids to colour back in 2009. Still available to download here. Another rather old post with lots of messy paint. Aw, Ffi looks so teensy (and mucky) in this photo. Hard to believe she'll be six years old in a few weeks! "Help us Obi Wan Kenobi! We've run out of bog roll!" 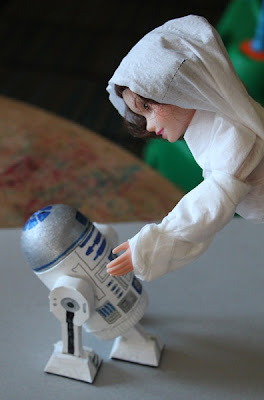 You always astound me with your absolute creativity and willingness to share it all...I'm a mom and a kindergarten teacher, so I'll be putting most of these ideas to good use! Thanks so much. The lollipop card is brilliant! I was going to send you an email about Family Fun Magazine using your ideas too! I'm glad they are giving you credit and hopefully appropriate monetary funds for your contributions. That does make me feel good about them, considering how often we're hearing about big name companies stealing ideas from Etsy artists and other bloggers. I just wish they would mention your blog and point some of their traffic your way! Its truly wonderful what you do. Thank you! Loo roll Leiha cracks me up! 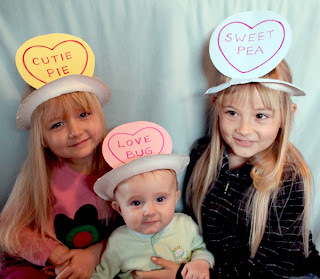 Love your crafts, and your three girls in their hats are darling!!! Thanks for the sweet words. I'm always encouraged to find the time to post this stuff when I know there are people that are getting something out of it. Having teachers interested in some of our crafts as well as parents means even more kids are going to be trying some of our ideas out and that puts a big smile on my face! Stella, Family Fun were great to work with and for a magazine with such a large readership, they are very friendly and personal in dealing with their contributors. If you look down the spine next to the project, it will have my name, but no blog link. I think that's just the way they do it. Love the lolly cards! And the plea for more TP! "I Love Grandma" has to be the sweetest thing I've ever seen! Super cute! Happy St.David's Day Filth Wizardry family. You guys always do such fun stuff. We made Welsh Cakes yesterday. 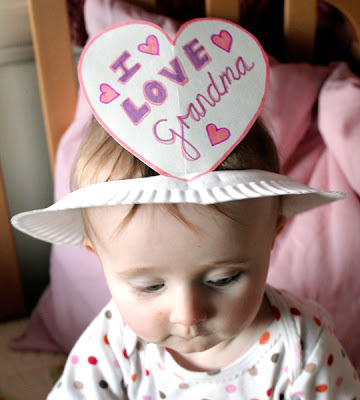 The baby with "I love Grandma" is absolutely adorable.